This is one of the designs from our very popular Felt Series. . The Fairies have been designed so they can stand and hold something speical in their bag - be it a tooth, ring or a special item. This kit has everything you need to complete 3 gorgeous Fairies and the patterns have very detailed instructions to ensure completion.. 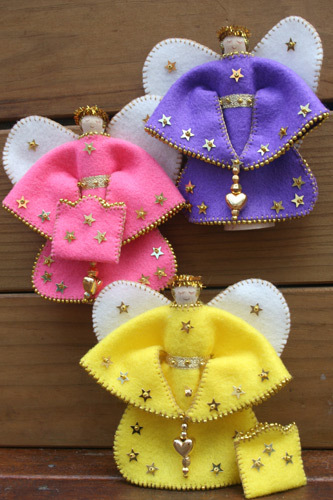 The size of an angel is 13cm (5in') tall. You will see in the photos, a Felt Colour Chart. Please view the colours and in the box below type the 2 colours you would like for your Fairies - 2 Fairies will be the same colour and one Fairy will be the other colour. DON'T FORGET TO CHOOSE YOUR 2 COLOURS!